I've decided to scale Christmas down this year. It seems that Thanksgiving is almost forgotten with the rush to start buying Christmas gifts earlier and earlier. So this year I have talked to my kids about not overdoing the holidays. They will be receiving one large gift from my husband and I and that's it. Now granted they are wanting electronics this year so the one big gift will be a little pricey, but it will still be less than the madness of previous years. In past years between family on both sides my kids have gotten more toys than I would like to admit. This year we will enjoy a big meal with family and the gifts will take a back seat. No mad dash for gifts and the frustration over not finding the 5,000 toys on my kid's wish lists. The weather here has been cold and is supposed to get colder this week. Since the weather has been less than pleasant I have been making a lot of hot meals. 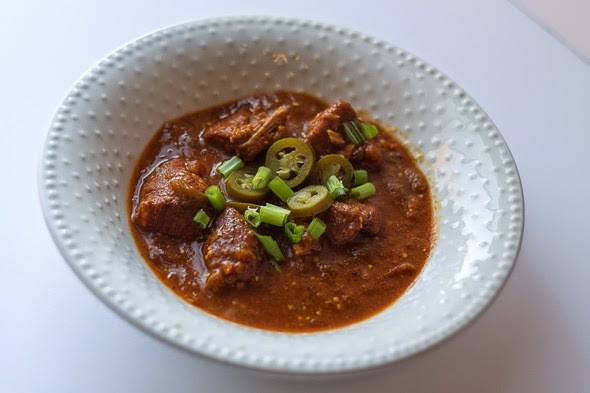 Chili is a family favorite and this recipe for Pork and Tomatillo has great flavor and the meat is very tender. Toss 1 tablespoon canola oil with the tomatillos and tomatoes on a baking sheet. On the other side of the baking sheet place the poblanos and jalapeños. Broil in the oven for 10-15 minutes or until blackened. Place the peppers in a bowl and cover with a plate or plastic wrap. Let the peppers soften for 10 minutes. Take the skins off the tomatoes, then core and chop. Peel and seed the peppers. 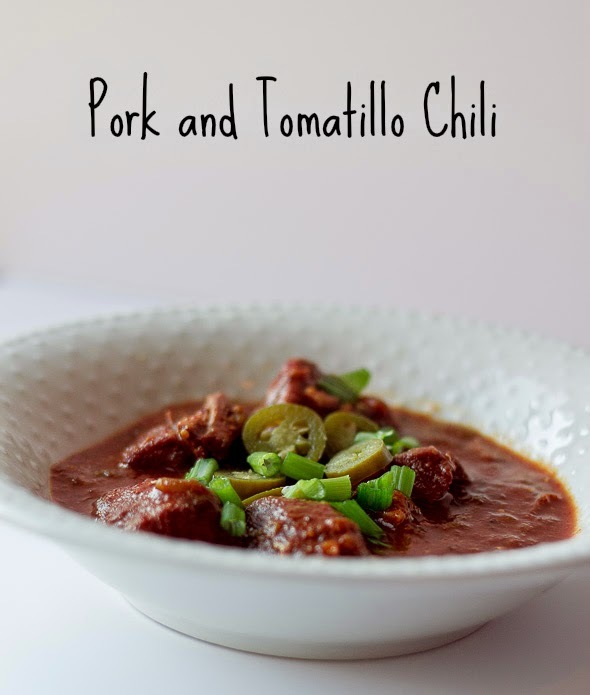 In a bowl combine the pork with the chili powder, cumin, 2 teaspoons of salt, and 1/4 teaspoon of pepper. In a pot over medium heat add 2 tablespoons canola oil. Add pork and cook 3 minutes until browned. Add 1 tablespoon canola oil and add the onion and garlic. Cook 3 minutes until softened. Add cornmeal and cook for 1 minute. Add the peppers, tomatoes, and tomatillos. Scrap up any brown bits from the bottom of the pot. Add the broth and pork and bring to a simmer. Cover and let cook for 1 1/2 hours, stirring occasionally. Uncover and salt and let cook for another 30 minutes. Remove from the stove and let cool for 10 minutes. You can add sliced scallions, pickled jalapeños, or grated cheddar cheese for toppings. When you trim the pork make sure to keep some the fat for cooking. 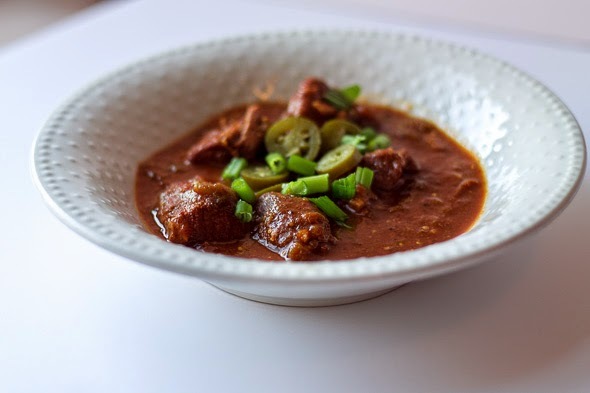 If you don't have some fat your chili will dry out and your pork won't be as tender. It may take longer for your peppers to char than 10-15 minutes. Just make sure to flip them when one side blackens so they cook evenly.